New all-reflective plates hit the streets in the last week of December, 1999. These started at 100-NZN for new registrations, and feature much narrower dies. These new plates can accommodate 7 characters with the narrow dies, but for the new 7-digit plates introduced in 2015 a still smaller die set was used. Since this was a general re-issue, all older plates were replaced with the new style with the same number. After renewing their registration, the DMV sent the motorist a red “replacement sticker” decal. These were to be placed on the plate so that the old plates could continue to be used while the new replacement plates were manufactured. Once the new plates were in use, the DMV did not require return of the old plates. The first few letter series (-NZN, -NZO etc.) had a wide space between the numbers and letters on the plate. The spacing was compressed by the end of the N series. 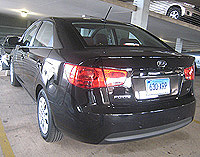 Starting in September 2008, Connecticut moved the registration expiration decal to the front windshield. This was reportedly done to combat theft of stickers from the plates, which was becoming a more common occurrence. August 2008 was the last plate decal used. Most motorists left the final decal on their plate, thus it is common to see plates on cars with 2006, 2007 and early 2008 decals. Others scratched the decals off, leaving unsightly gouges in the reflective background. Very few took the advice of the DMV to simply cross the decal information out with black marker. Beginning August 1, 2010, even windshield stickers were discontinued. Thus, there are 5 years of windshield stickers – 2008 through 2012. After the 123-ABC format was exhausted, a format of 1ABCD2 was used. These started at plate number 0AAAA0. Initially, no separator or space was present and the plates in this format are essentially unreadable. How this numbering sequence was allowed to be issued as it was is truly puzzling – even law enforcement could not quickly decipher these plates. Later, after plate 9AGGX9, a dot separator was introduced between the first two letters and the second two. This was a small step in the right direction, because now there is at least the possibility of catching half of the plate number. In mid-late May 2015, the cumbersome numbering format was finally abandoned and replaced with an AA-12345 format beginning with plate AA-00000 (not a sample). This numbering format is now shared with pretty much every other type classification in Connecticut, which makes easy identification of the type of plate nearly impossible now. Several types of the ‘Replacement Sticker’ decals were issued. The original variety was bright red printed on white paper. A second type with larger letters on a darker background appeared in Feb. 2002. These were white printing on a red plastic decal. The white printing on these came off rather easily, as seen in the above picture. A third type was reflective vinyl, and very similar in appearance to the first type shown. 2002. Issuance of this type began at the -NZN series. The first few letter series had a wide space between the numbers and letters. 2002, with numbers/letters closer together. 2005 – This combination of plate and decal shouldn’t exist. The old blue plates should have been off the road by the end of 2002. Starting with September 2008 expirations for those renewing by mail, windshield stickers were used instead of license plate decals. Careful recordkeeping will now be the only way to date plates in Connecticut. 2008 windshield sticker. This was the first month of expiration for these. 2012 windshield sticker. This was the last year of expiration for these, and they were only issued for a couple of months of 2012 expirations. For 2012, the holographic decal was replaced by a barcode, and the black month and year designation were now printed with an inkjet-type printer. The month and year faded fairly quickly in the sun. Toward the end of the U-series, a change was made to Avery reflective sheeting for the background. Note the sharp deliniation between the blue and white areas towards the bottom of the numbers. A new format was started at plate 0AAAA0. These plates are very hard to decipher quickly. This is one of the last plates in this silly configuration. After plate 9AGGX9, a dot was added. The dot was added in the center of the plate presumably at plate 0AG-HA0. This helped legibility a little bit, but it is still a cumbersome numbering format. By the way, that is a zero at the end, not the letter O. Near the end of this numbering format; 9AX-XX9 was probably the last number issued. In mid-late May, 2015 a new numbering format hit the roads: AA-12345. A few early plates were seen in May but they were not issued in great numbers until August 2015.